MIKE KIDD?S ATTEMPT TO HELP A FRIEND LEADS HIM INTO A CAT-AND-MOUSE GAME WITH A SERIAL KILLER THAT TURNS THE HUNTER INTO THE HUNTED. Mike Kidd?s unambitious life pattern is interrupted by a request from a friend who is having fugues, episodes of unremembered activity. He wants Mike to find out where he goes and what he does. He is afraid that he may be responsible for murders committed by someone the news services have branded ?The Lady Killer.? Taking on this assignment will place Mike?s reputation, his relationship with the woman he loves, and eventually his life at risk. Charles Hayes is a natural storyteller. He has the rare ability to take a few murders, throw in a little suspense, add a handful of genuine, quirky characters, and trap his readers in a mysterious set of circumstances that occasionally causes them to laugh out loud. Who?s guilty? Who?s innocent? Or is anybody innocent? His novel, Ladies Don?t Wrestle, is as much fun as anybody can have while caught in a puzzling cat and mouse game of crime, serial killers, and double jeopardy. He draws his readers smack dab into the middle of the story.-Caleb Pirtle III, author of Secrets of the Dead. 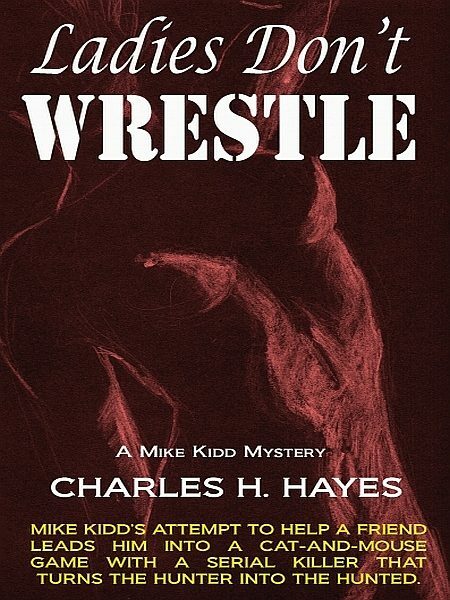 Charles Hayes is a skillful writer with a knack for setting a scene, creating realistic, believable characters and keeping the action rolling. With Ladies Don?t Wrestle, he brings back the delightful ensemble of engaging characters first introduced to readers in The Briefcase, which alone makes this well-crafted novel worth reading. The intricate plot is a mixture of old-fashioned gumshoe sleuthing and enough techie-geek stuff to both impress and baffle Raymond Chandler. Put all this together and you have a first-rate mystery with a surprise conclusion that hits the mark. Treat yourself to another great read.-Preston Holtry, author of The Good Thief, Vol 4 of the Morgan Westphal Mystery Series. The hunter becomes the hunted in this gripping story of murder and intrigue. Set in Hayes? native East Texas, he makes readers feel right at home in this good old fashion whodunit. Hayes is a gifted storyteller with a special talent for creating robust characters that stay with you long after the pages are closed. Set aside some time, Ladies Don?t Wrestle is hard to put down.-Steve Brigman, author of The Orphan Train. Charles Hayes has out-done himself with Ladies Don't Wrestle. It is well-researched, both exciting and poignant, with wonderful characterizations. I didn't just read it; I was literally drawn into the story and became an unseen participant.-Tom C. McKenney, author of Jack Hinson?s One-Man War.